Tri-Ply stainless combines the even heating of lightweight aluminum with the durability and corrosion-resistance of steel in an elegant design. Aluminum core between 2 stainless steel layers provides even heating for excellent browning and control of the cooking process. Non-porous stainless steel cooking surface is safe for use with all utensils. Elegant brushed stainless steel exterior can go from the oven or stove directly to the table. Reflective cook surface makes it easy to monitor foods as they cook and remains beautiful over time. Clear tempered-glass lids let you see food while it’s cooking and are oven safe, so you can finish covered dishes in the oven or keep them warm until ready to serve. Adapted from a traditional round-bottom wok, this flat-bottom wok has a wide cooking surface ideal for stir-frying on gas or electric ranges. The domed cover is perfect for steaming and simmering soups. Long, brushed stainless steel handles stay cool on the stovetop. 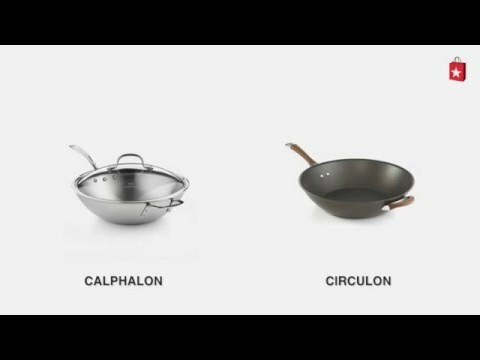 All cookware is dishwasher-safe and carries Calphalon’s full lifetime warranty.Aluminum core between 2 stainless steel layers provides even heating for excellent browning and control of the cooking process. Non-porous stainless steel cooking surface is safe for use with all utensils. Adapted from a traditional round-bottom wok, this flat-bottom wok has a wide cooking surface ideal for stir-frying on gas or electric ranges. The domed cover is perfect for steaming and simmering soups.